In 1988, the Department purchased a diskless Perkin Elmer 1605 FTIR. To help in the process of being able to store the IR spectra recorded, two Pascal programs were written. The first to capture the files via the serial port (RS-232) and the second to display the data. For information on the first program, FTtoPC, and other DOS utilities to convert files obtained from various instruments to JCAMP-DX format, see our JCAMP-DX utility page. The original display program was totally rewritten in C++ and the code licensed to MDL in 1998 for incorporation into their plugin CHIME. Our contract with MDL has now finished (November 2005) but we will endeavour to be involved with future upgrades to the CHIME plugin. The last release (2.6 SP6) was April 2004 and this is available from the MDL web site.. In March 2006 we released JSpecView as an Open Source project at Sourceforge. A report on this is published in Chemistry Central Journal 2007, 1:31 (07Dec2007). The JAVA applet and application along with source code is being developed with JAVA 1.5+. In some of the demonstrations and examples we show the use of links between spectra and molecular graphics display such that clicking on peaks in a Mass Spectrum will highlight the relevant FRAGMENTS in the molecule, clicking on peaks in the IR spectrum will highlight the relevant BONDS or animate the vibrational mode and clicking on peaks in the NMR will highlight the appropriate protons or carbon atoms. See below for more details on how to set up these links. With the widespread use of the WWW growing so unbelievably fast, the idea of being able to link not only molecular coordinates via MOL (PDB) format to a document, but being able to display various types of spectra seemed a wonderful opportunity to enhance the teaching of spectroscopy. To that end, problem sets can be established of known and unknown samples to view. See a makeup demo of how this might look. The possibility of sub-structure searches returning structures and spectra can now be accomplished. To configure the CHIME plugin, all you need to do is run the installer. To test, try out the demo files or sample testdata files. For the JAVA application, JSVApp.jar, there are several files that need to be available in the same directory as the jar file. See the README.txt file in the file release for details. The JCAMP-DX data exchange formats and standards are currently the responsibility of the IUPAC Committee on Printed and Electronic Publications (CPEP). The CPEP JCAMP working party is chaired by Antony Davies, ISAS, Germany. Joint Committee on Atomic and Molecular Physical Data Exchange References. A copy of some of the following papers is available in Adobe Acrobat (PDF) format from the JCAMP-DX web site (www.jcamp-dx.org). JCAMP-CS vs 3.7 Ref. : Applied Spectroscopy, 1991, 45, 4. JCAMP-DX vs 4.24 for IR Ref. : Pure & Applied Chemistry, 1991, 63, 1781-92.
for NMR vs 5.0 Ref. : Applied Spectroscopy, 1993, 47, 1093-1099.
for MS vs 5.0 Ref. : Applied Spectroscopy, 1994, 48, 1545-1552.
extension 5.01 for NMR, Ref. : Pure & Applied Chemistry, Vol. 71, No. 8, pp. 1549-1556, 1999. For an historical account of JCAMP-DX development, see the summary posted on the bionet.structure-nmr news group in January 1996. A local copy has been made available by the author. The pages on JCAMP-DX by Antony Davies and Bob McDonald are essential reading for anyone interested in learning more about the JCAMP-DX specifications. The method of encoding data, relies on substitution of numbers by ASCII characters. The following gives the compression tables used for this purpose. The earliest mechanism for creating the links was to add new HEADER items to the JCAMP-DX file (##$ASSIGNMENT TYPE= , ##$CHIME TARGET= along with ##$PEAK LINKS= ). //edit the following lines with caution! //you should not need to edit the html files. The HTML file (acetophenone.html) that calls these files gives an example of linking IR spectra to molecular display and loads a single animation file (xyz) containing the vibration vectors. When peaks are selected in the JSpecView spectral display the appropriate FRAME in the xyz file is displayed. Jmol is another Open Source project available from Sourceforge. A collection of files useful for checking JCAMP-DX programs have been assembled from various sources. Some provide error free information, while others are more of the nature of an "assault course for JCAMP-DX". Some FAQ on scientific data formats (including JCAMP-DX) have been collated by Ilana Stern and posted at a number of sites. There are several other data formats commonly found in scientific laboratories such as NUTS for NMR and netCDF for MS and chromatography. A company that has for many years specialised in offering not only interfaces to equipment, but converters between data formats is Thermo Electron Corporation (formerly Galactic Industries Corporation). 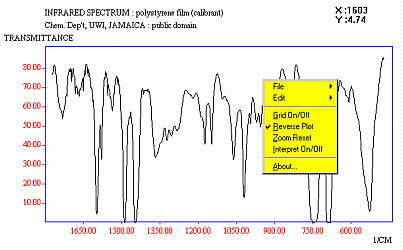 Their product, GRAMS, uses .SPC binary files and a number of sites offer spectra in this format. Thermo offer a SPC Developers Kit for programmers to create their own file converters etc. Try their searchable database of IR and Raman spectra. GRAMS/AI from Thermo Galactic Industries. JDXView and JDX2JDX free software and SOURCE CODE from Norbert Haider at the Univ of Vienna. ShowSPC and IR files from the US EPA. Acorn NMR software (NUTS), this can import and export JCAMP-DX files. NMR files in NUTS format at Pacific Lutheran University. Samples of MS, IR and NMR. KnowItAll from Bio-Rad, originally marketed as ChemWindows and the Sadler Suite, can read and display a wide range of spectral file types, including JCAMP-DX. A handy feature is that it allows you to insert live IR, NMR, MS spectra, and chromatograms into Microsoft applications like Word and Powerpoint. Another commercial company that has made a large impact on data visualisation and handling is ACD Labs. ACD/SpecViewer Freeware allows the user to view processed NMR, MS, UV, Visible, IR, NIR and Raman spectra through one interface. SpecViewer supports the following file formats: ACD (*.esp), Galactic (*.spc), JCAMP-DX (*.jdx, *.dx. *.jxs,*.jx) and ASCII (*.txt). SpecViewer also allows you to attach chemical structures to the spectrum, and to create reports for printing using their ACD/ChemSketch freeware. The ACD/Labs commercial programmes are able to use the drawn structure to predict both proton and carbon NMR spectra as well as physical properties. Copyright © 1994-2007 by Robert John Lancashire, all rights reserved. Created Oct 1994. Links checked and/or last modified 9th December 2007.